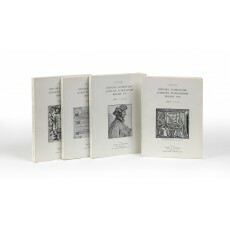 Two catalogues in five volumes (format varies), as issued, in publisher’s printed wrappers. 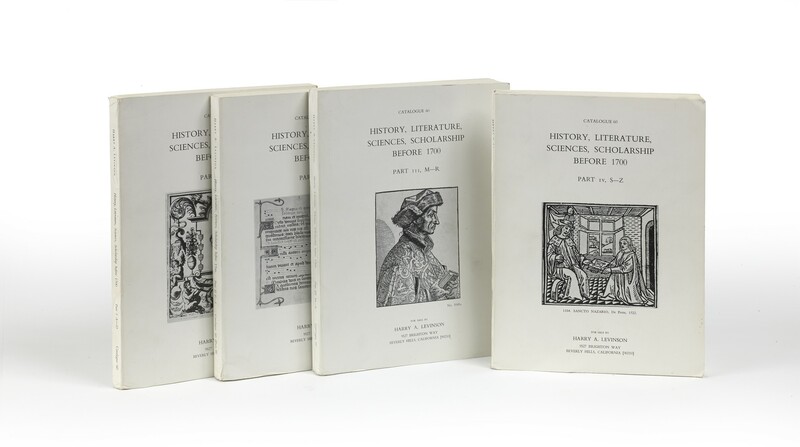 - Levinson’s four-part “Catalogue 60: History, literature, sciences, scholarship before 1700”, issued 1966-1972, offers some 1500 titles, including Jenson’s Plutarch (1478) and the Aldine Aristophanes (1498). “He considered it his finest work” (Donald C. Dickinson, Dictionary of American Antiquarian Bookdealers, Westport, CT 1998, pp.124-125). 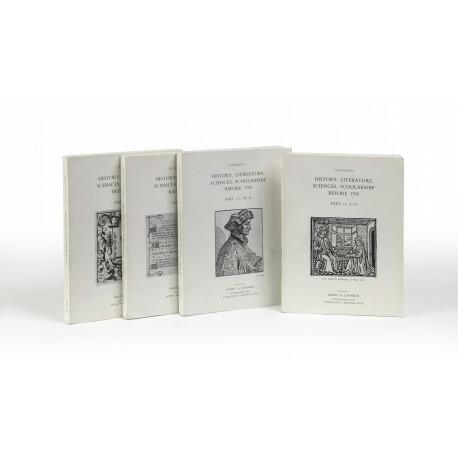 Levinson’s residual stock and reference library were sold by Christie’s, New York, 9 October 1996. ¶ Very good copies. ● Catalogue 66 is not shown in our photograph. Four volumes (25.5 cm), I: 87 (1) pp., 44 leaves of plates (pls.I-LXXXVIII; pl.LXXXIX on lower wrapper. Items 1-340 + 6 addenda; priced. II: pp.-198 (2 blank), 50 leaves of plates (pls.I-XCIX). Items 341-738; priced. III: pp.-304 (2), 58 leaves of plates (pls.C-CCXIV). Items 739-1080; priced. IV: (2), pp.205-430, colour frontispiece, 54 leaves of plates (pls.CCXV-CCCXXII). Publisher’s pictorial wrappers. - Includes (item 1217) a binding decorated with a cameo by Valerio Belli (on Sophocles, Rome 1518). ¶ Several discreet marks in margins (e.g. p.342). (28 cm),  pp., illustrations. 117 items; priced. Publisher’s pictorial wrappers. - “This is my first rare book catalogue in ten years; I plan to issue two others of the same high quality in the near future. This catalogue was written and edited by me and Al Seckel…” The catalogue advertises “a large library of over 3000 books and manuscripts on witchcraft, folklore, magic, astrology, cabala and related subjects, from the fourteenth through the twentieth century… It is offered for sale en bloc. Price on request”. This is the library of the Canadian mystic Manly Palmer Hall (1901-1990), now at The Getty Research Institute, Los Angeles.